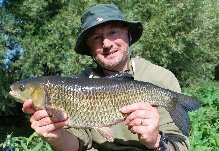 If you are fortunate enough to have a river where it is possible to watch your quarry, stalking chub with natural baits is a tactic that can prove supremely successful in selectively targeting bigger fish. It is also the definitive method where time is short as it requires so little preparation; tackle can be stripped down to its simplest form – in fact, everything you are likely to need can be stashed in a couple of pockets. My rod is a Drennan 1.5lb test ‘Super Specialist’ rod, matched with my old faithful Shimano 3000 GTM, this is spooled with the superb Drennan ‘Super Specialist’ mono in 6lb – It is tough as old boots and is man enough to cope with being dragged through submerged tree roots under tension. My pockets are armed with hooks in sizes 6, 4 and 2, swan shot, scales and forceps covering all eventualities. My camera and tripod are the bulkiest of my requirements and a necessity due to the procedure of ‘self take’ photography. A Gardner specialist landing net handle and deep pan net complete the set-up. I take great excitement from exploring the weird and the wonderful in terms of baits that can be used for stalking; but more often than not, it is a case of simple availability. 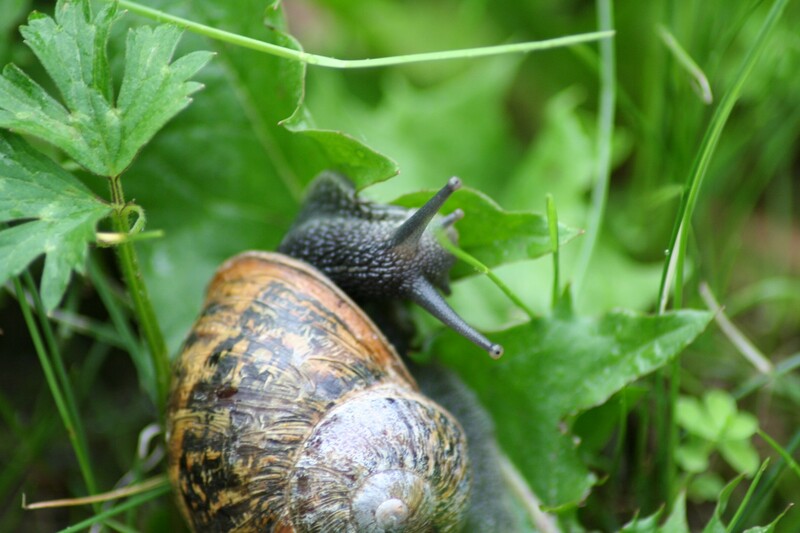 In the opening weeks of the season, it just happened to be an abundance of garden snails and my desire to protect my lily like Hostas from being eaten which came to the fore – quickly gathering a couple dozen of the blighters seemed the right thing to do! I prefer snails to slugs as they are easier to handle. I do crack them out of their shells – a simple procedure; with forceps crack gently either side of where the centre of the spiral forms and then shell them. Mounted on a size two hook, their homogeneous lack of any definitive shape and resulting ‘plop’ just looks and sounds right to Mr Chevin. I suspect that fish which have become accustomed to being fed in a certain place in relative safety are actually quite naive and trusting to a presentation that has been so rewarding regarding their past experiences. Or so I thought…… In fact, the first cast into the swim during that opening week, my snail bait alighted onto the surface with a satisfying ‘plop’ and was only nudged by two individuals as it descended to the bottom……. Now, every time I had previously flicked a bait into the water in the weeks leading up to the new season, it was engulfed instantly. The only difference this time was that I had ‘rod in hand’. Even confident Chub are very ‘switched on’ and noted the additional presence of a rod over their sky-line. In this instance, I felt it best to leave well alone and return later, modifying my approach. A change of position just upstream facilitated a cast out of sight with a very surprising result. I could not actually see the fish take the snail, but finger poised on the open spool ready to give line, the line straightened and with finger removed, the fish took off confidently before closing the reel and tightening into the fish. After a short battle where the fish tried to bury its head in the near bank cabbages, it was extracted and returned a little way upstream. It was a superb looking fish going 4lb9oz. I took advantage to peer into the swim and was encouraged that the fish did not look too perturbed by the loss of their companion. I looked at the mangled snail and suspected the effort required to shell out another would not offer a return considering the recent commotion, so casually cast it back into the swim just to be polite really. Much to my surprise, another fish had evidently taken the bait; I hurriedly slammed the bail arm shut, struck and marvelled as my rod as it took on a satisfying curve – the fish boring deep within the cavity of its willow branch canopy. Quickly beaten, I was admiring my second five of the season in the folds of my net, a stunning Chub of 5lb6oz. Two Chub within 5 minutes, same swim, on the same bait and a ‘five’ to boot!! Where a Chub is hooked in clear water, it is quite common for other members of the shoal to jostle the hooked fish in an effort to bring the fish into conformity with the rest of its shoal members. It must generate a degree of panic which is communicated throughout the shoal. This incident reinforced to me how important it is to return fish a safe distance from the rest of the fish – returning a stressed fish kills a swim dead. Stalking is the perfect opportunistic form of fishing. It would be fair to say that the dog has not benefited from so many river walks in its life and my wife even praised my recent devotion, bless! The rod accompanied my every walk, casually observing, actively fishing. 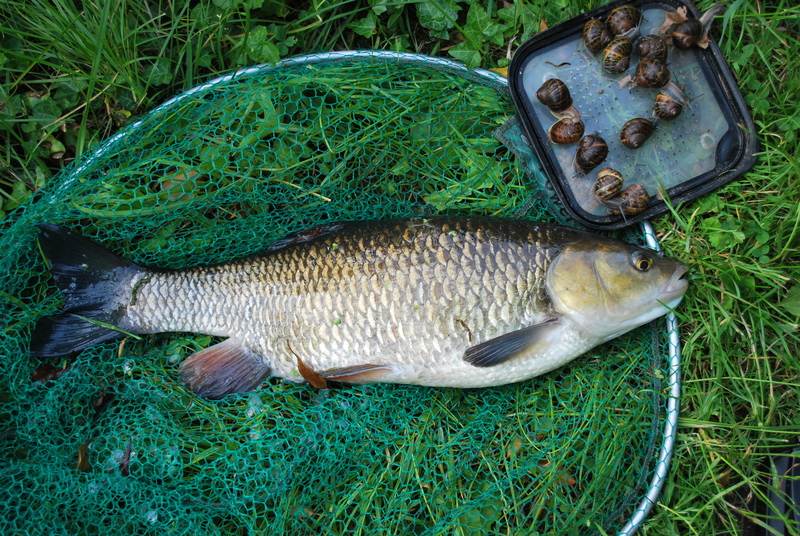 Baits varied between slugs and snails dependant on availability and as the opening month of June progressed, the Chub were still happy to oblige. A third good Chub of 5lb3oz came out to the ever faithful snail just on a hunch. This style of fishing is not just limited to a direct visual contact – it always pays to drop a bait into swims that just look like a Chub should be present – taking a ‘fortune favours the brave’ attitude, it paid off in this instance as I weaved the cast between the branches right within a fallen tree canopy. An advance with the ‘super naturals’. Fish soon get wise to items plopping on their head unannounced removing shoal mates. With bread, slugs and snails proving a challenge, it was time to roll out the ‘super naturals’. A bait I look to in this instance are the ever faithful Locust; simply hook them behind the head on the ‘saddle’ thus allowing the whole form to float and struggle within the watery meniscus. They work superbly presented to visible fish, however, a blind cast often draws fish some distance with surprising results – Chub find them irresitable! The great thing about Locust is that they are quite robust and are not anywhere near as difficult to keep alive as they might seem. I buy mine from the pet shop as fresh as possible and have learnt delivery dates for the various stockists in the area. 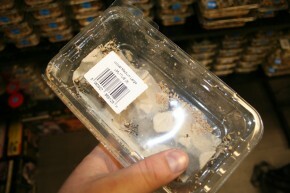 If I plan to keep them any length of time, I empty them into a small plastic tank with a ventilated lid. I did have a preference for the slightly smaller stage 5 hopper size locust and will still purchase a box, but this year come around to using full grown adults. They are not too expensive and work out at approximately 30 pence each, the smaller ones around 15p. To keep them in good condition, it is best to avoid extremes of temperature. The optimum storage temperature is around 15 degrees C, so that will be the shed on the concrete floor! Feed wise, a few bits of green leaf and potato peelings keeps them happy enough for a few weeks. It’s amazing how quickly a bait can establish itself as a ‘confidence bait’. It has got to the point that I would not really consider Chubbing in clear water without a box in my bag and for many weeks now have a constant stash of them to use whenever I get the urge. The only problem with Locusts is that they are quite light and difficult to cast any distance if there is a bit of wind. To give myself the best chance, I have started to use size 2 Korda wide gape hooks. Partially as they offer a good hook up due to their size and secondly, they are quite heavy and gave me a bit more confidence punching a bait out (there were some other advantages which I shall come to later). It is difficult to describe how enticing this presentation is to Chub! If a Chub is at home, Just by passing a floating locust past tree cover will send them scuttling out to investigate. Even a miscast to a visible fish had it bolt out from within its tree lined sanctuary to intercept the struggling creature mid stream….. These fish are highly tuned to their environment and are fully switched on to what’s happening in their manor! Takes are variable; anything from aggressive, to gently sipping them off the surface. But as of all good things, they are destined to come to an end. The Gipping chub largely existing in isolated pockets and as good as a floating, struggling Locust looks, they will eventually be viewed with caution. I really could not be bothered to keep changing hooks so use the same Korda size 2 wide gape hooks for all my stalking. It’s not just laziness on my part; I have become used to how it behaves when baited up. For example, a single adult Locust will float on the surface. However, if I were to place a single smaller locust (Stage 5 hopper) on the same sized hook, it would be drawn under the surface in an enticing slow sinking presentation. I pass the hook so that the fleshy body is fed around the curve of the hook thus concealing all but the point and barb within a tangle of writhing legs. I have had a few bonus fish this season that fell to the slow sinking presentation that would not touch a surface bait. A third presentation that has proved useful was to place 2 small Locusts tail to tail on the same hook which gave the impression of a pair of mating insects floating on the surface – once again a surface presentation, but very different in appearance to the single large Locust that may have been seen before; not to mention, twice as much surface disturbance! 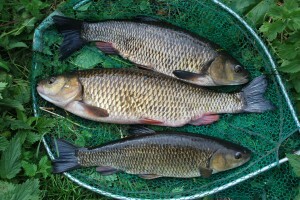 Each presentation offers something different and has caught Chub this year. 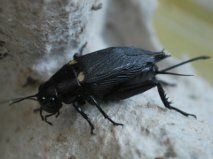 Another bait I have up my sleeve are Black crickets and once again readily available as a live food from the pet shop. These are not quite as buoyant as the crickets, but it is possible to present them on the surface if paired up on a light hook. As a change bait, they are particularly useful. I had cast out a Locust to a small group of fish, but when an individual engulfed it, it was simply pricked on striking. Once associated with danger, it was not possible to induce a take though the Chub still looked interested by racing up to it, only to turn tail away swiftly. Matching the size of bait to the hook took 3 black crickets on the same Size 2 hook; this gave a satisfying slow sinking presentation of writhing black legs and torsos. This was pounced on by a fish of 4lb2oz…. However, I was a bit gutted as I had narrowly missed out on another much bigger fish visibly charging towards the same bait, but that’s fishing! What I love most about this type of fishing is the unbridled freedom it offers. It presents challenges and a form of creativity that makes it thoroughly absorbing. I have clawed my way through bushes, climbed trees, jumped in to extract snagged fish, been stung beyond belief on hands and knees and simply learnt far more about my quarry than had I adopted a more sedentary approach. The art of stalking has little changed in centuries, and it only seems fair to give credit to Isaak Walton himself for so adeptly describing the art in a way that became so alive and vibrant on my own riverbank…. It was as if Walton’s foots steps had fallen gently beside my own, his words of wisdom gently filling the soft summer air…. ‘Go to the same hole in which I caught my Chub, where, in most hot dayes you will find a dozen or twenty Chevens floating near the top of the water, get two or three Grashoppers as you go over the meadow, and get secretly behind the tree, and stand as free from motion as is possible, then put a Grashopper on your hook, and let your hook hang a quarter of a yard short of the water, to which end you must rest your rod on some bough of the tree, and it is likely the Chubs will sink down towards the bottom of the water at the shadow of your Rod (for a Chub is the fearfullest of fishes,) and will do so if but a bird flies over him, and makes the least shadow on the water: but they will presently rise up to the top again, and there lie soaring till some shadow affrights them again: when they lie upon the top of the water, look out the best Chub, which you setting your self in a fit place, may very easily see, and move your Rod as softly as a Snail moves, to that Chub you intend to catch; let your bait fall gently upon the water three or four inches before him, and he will infallibly take the bait, and you will be as sure to catch him: for he is one of the leathermouth’d Fishes, of which a hook does scarce ever lose his hold: and therefore give him play enough before you offer to take him out of the water. Go your way presently, take my Rod, and do as I bid you, and I will sit down and mend my tackling till you return back’.